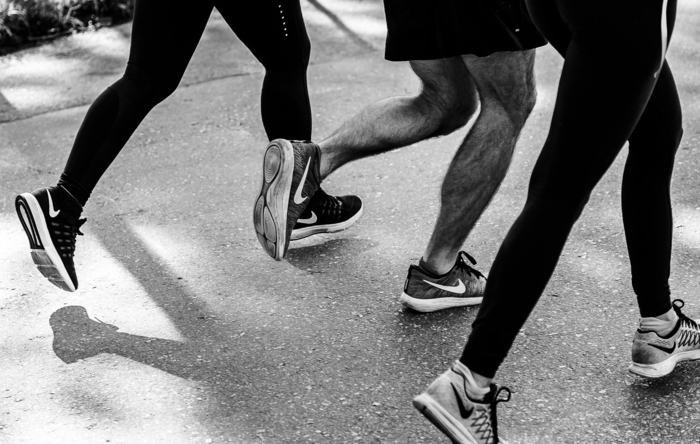 Image: photo focused on the feet of three people running by aquachara via Unsplash, Unsplash License. Sexual reproduction is scarce in skin infection culprit. While some people love to feel the burn during a workout, we generally seek that sensation in our muscles—not our feet. Treading barefoot in damp, communal environments like gym showers and the perimeters of pools can expose us to the fungus Trichophyton rubrum, the most common cause of athlete’s foot. Despite its name, athlete’s foot isn’t found exclusively in fitness fanatics—it affects around 15% of people worldwide. New work published in GENETICS shows that across this global range, the T. rubrum genome varies surprisingly little. T. rubrum is widespread and comes in many varieties called morphotypes that differ in characteristics such as which parts of the body they can infect and the appearance of their colonies. In this study, the researchers found that T. rubrum samples from around the world were remarkably genetically similar to one another despite representing many different morphotypes. The data also suggest T. rubrum rarely, if ever, sexually reproduces. Mating in many fungi occurs between cells of different mating types, but of the 135 samples tested, the mating types of all but a single Mediterranean strain were identical. The researchers found no evidence of mating when they paired the Mediterranean strain with strains of the opposite mating type, which supports the idea that the fungi reproduce clonally. This result comes with some caveats, though: the lab conditions may not have favored mating, and it’s possible that mating does occur when the Mediterranean strain comes in contact with some of the other strains in the wild. Overall, the results are consistent with one hypothesis that has been put forth about the fungi, which that is the species recently experienced a sharp decrease in sexual reproduction. The authors suggest this might have occured when T. rubrum began specializing for growth on humans. Given that pathogens must dodge the defenses of their constantly adapting hosts, it may seem strange that T. rubrum exhibits such low genetic diversity, but it’s not alone in this trait. For reasons that haven’t been fully established, bacteria that cause tuberculosis and Hansen’s disease (leprosy) also come in a variety of types despite being highly clonal. Although T. rubrum infections are treatable and rarely progress to serious disease, they’re common and often extremely uncomfortable. Those of us who wear sandals in the gym shower would certainly agree it’s well worth it to learn more about how this pesky fungus operates.